The Morning Light that is. 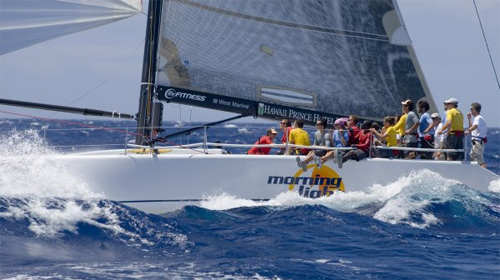 For those who haven”t heard of it Morning Light is a documentary put together by Disney that follows 15 young sailors as they train and race a TP52 in the 2007 TransPac. Basically Disney took 30 sailors and picked the 15 they liked best to train in Hawaii and then let the team pick the final 11 who actually got to race the TransPac. The movie shows some of the selection process and their training while introducing you to the sailors. Most of the 2nd half of the movie is about the race itself from the star in California to the finish in Hawaii. You are introduced to all 15 sailors and get to know them as the movie progresses but the truth is it”s too many people and not enough time to really figure out who”s who aside from a few of the key people. They way over dramatize the selection of the 11 crew for the race – they call people one by one into the room and announce who gets to be on the boat. The race itself is fairly interesting – the film focuses on their rivalry with Samba Pa Ti during the race. It”s hard to say how much rivalry there actually was but it makes for good entertainment since the boats were fairly close together at one point during the race. They also show some interviews with the owner of Samba about the race. Importantly the movie doesn”t just take a try to explain everything and appeal to everyone approach. I was actually pleasantly surprised at how little I found myself thinking: oh great an explanation of how tacking works (there was one but it was fairly brief). I had expected there to be a lot more catering to non sailors. This might mean the movie wouldn”t be as interesting if you don”t sail but I”m gonna assume that if you”re reading this you probably do. Obviously there is some heavy editing that goes into a documentary like this. They focus on the people who they felt were more interesting, some of the guys on the boat barely get any camera time and others get lots. It”s obvious there are details left out and huge portions of time skipped but it tells a good story and stays interesting to watch throughout. So is it worth watching? I didn”t have high expectations but I ended up really enjoying the DVD. It”s a great movie to watch with some friends, maybe poke fun of a few parts and watch what to my knowledge is only the 2nd sailing movie ever (that scene at the beginning of Thomas Crown Affair doesn”t count). I”d also think that it”d be great for sailing schools or other kids who are just getting into sailing. The reality-show type approach is accessible to them and there”s plenty of fun, fast sailing to watch. So I think Morning Light is worth a look. Besides it”s a Disney movie so there”s some awesome previews for the re-release of Fantasia from the “Disney vault” that I already have on pre-order that you have to sit through at the start of the DVD. Anyone should feel free to add to the list and make James feel more foolish.